It's been over a year since my last post. I miss blogging. I miss that it made me focus on my photography skills. The light was rather pretty shining down on these freshly sterilised jam jars drying on the Aga. So while I was simmering my cumquats for marmalade, I took a few snaps. In the last year we have bought a little farm in Red Hill on Victoria's Mornington Peninsula. The farm has a rather fabulous kitchen garden, with quite a lot of varied citrus trees. I have been making jams and marmalades like a woman possessed. So far this week I've made strawberry jam, two batches of cumquat marmalade, and lemon marmalade. There has also been cumquat ice-cream in the mix. Now that's something fabulous I recommend everyone should try. I love these Weck preserving jars. The top shelf of my pantry is now stashing a lovely collection of jams in jars. I'm still working on identifying the perfect setting point for the jam. This cumquat marmalade is too runny, which, on the bright side, makes it perfect for stirring into ice-cream for the afore-mentioned cumquat ice-cream. But my main reason for popping in here is to share with you the jam labels I created. These are just a sample of three of them. There are 11 - five types of marmalade, and 6 different fruit jams from fig to strawberry. They are designed to print onto these labels. But if you didn't want to purchase this specific size, you can get a box of label sheets and cut to whatever size you like. You can download the labels by clicking the button below, or find them in my left sidebar. Lately I've become a bit obsessed with smocking. If you follow me on Instagram you've probably realised that. I worked out the Eloise Gathered Top PDF Pattern lends itself rather well to smocking. I added about 8 inches to the width of the front pattern piece, so there's lots of fabric to smock. Last week I visited Amitie, my favourite fabric shop, and picked up a few new fabrics, including one of Anna Maria Horner's woven yarn dyes. This probably isn't the sort of fabric I would normally use in dressmaking, but when you add the smocking element, I couldn't resist it. There was a bit of trial and error with this top. I attached the neck binding three times before I was happy with it. I have been Pinning lovely images of smocked tops on Pinterest and getting inspired. This is a long sleeved raglan top with sleeve ends gathered into a cuff. I think it will be cute over a little denim skirt and tights this winter. Adelaide has a fuscia coloured Jacadi cardigan that goes perfectly with it. I had company in the studio this afternoon. Henri and I passed a lovely couple of hours in the attic with the sun streaming in. He was doing some sketching in a sunny spot. The perfect Sunday afternoon. I'm very happy to announce that my latest pattern, the Eloise Gathered Top, is now available in my Etsy store. After lots of requests for this pattern, I pushed it to the top of the list of patterns to digitise. This has been a favourite of Adelaide's too, as it is easy to slip on and off and is comfortable to wear. She particularly loves it in Amy's pretty voile fabric, pictured below. I think you will love sewing this pattern. It's quick to whip up and suits seamstresses of all abilities. You can also add pretty details like trim to the sleeves, trim to the bodice or pin tucks. I particularly love a fuller style top like this with the Chloe and Cooper Cuffed Pants on younger girls. You can buy the two patterns together and save 10%. I put the request out on the Townmouse Patterns Facebook Group for some proof-reading help on the just released Eloise Gathered Top pattern. Some gorgeous girls came to my rescue and I have now incorporated their valuable feedback to make the pattern the best it can be. 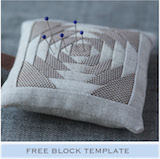 Candice, one of my most trusted, regular pattern testers mentioned understitching. This wasn't a term I was familiar with, even though I regularly use the technique. I just don't call it by its right name. So I thought I'd show you a little step-by-step of the understitching technique, that you can refer to when whipping up the Eloise Gathered Top. Understitching is used when facing a neckline or opening of a garment and you want to keep the facing in place and stop it rolling to the outside of the garment and being seen. The under stitching holds it neatly in place inside the garment. 1. With right sides together, stitch the facing to the front garment piece. 2. Trim back the seam and, where your seam is curved, clip into it at intervals. 3. Press the seam allowance towards the facing. 4. Working from the right side and very closely to the seam line, stitch the seam allowance to the facing. 5.Now press the pattern pieces into place. 6. From the wrong side you should be able to see the garment's main fabric, as the seam line is rolled slightly to the inside. 7. From the outside you will not be able to see any facing. This little Eloise top is going to the newborn sister of one of Adelaide's school friends. It's size 0 (6 to 12 months) so I hope it will be the perfect fit for her next summer. Who doesn't love Amy's blog NanaCompany? And if a beautiful blog isn't enough to satisfy you, there is her book and now her fabric collection. Paperie is Amy's debut fabric collection for Art Gallery Fabrics. Amy very kindly asked me if I would like to participate in her Paperie blog tour. Absolutely! I was very excited to receive some yardage of the pretty print Eponine in voile. I couldn't wait to start playing with this fabric and thought I'd test my two new upcoming patterns in it. This is the Eloise Top. Since I released my pattern for the Cuffed Pants I've had many enquiries about a pattern for the pictured accompanying top. With so many requests for it I pushed this pattern to the top of the "to be released" queue. The paperie voile is a lovely weight to sew little tops with. Adelaide absolutely loves this fabric so was very excited to get some new clothes in it. You can see how pretty this print is up close. The other thing I love about Amy's fabric range is how easily it blends with so many unexpected colours. I pulled lots of fabrics from my stash that worked with Eponine, but in the end went with this raspberry dot fabric that is leftover from my range production a few years back. This is the Sienna Gathered Skirt which you first saw here. I've struggled to get this skirt off Adelaide in the last few days of the summer holidays. There's something about a full skirt that always appeals to little girls I've found. Now the Paperie skirt and top are hanging on Adelaide's wardrobe door. They look so pretty together, I didn't want to put them away with her other clothes. These two patterns will be released in the coming weeks. 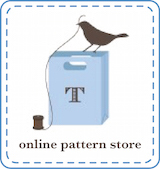 Please follow TownmousePatterns on Instagram or here on the blog for release details. In the meantime, order your Paperie fabric before this pretty range sells out. You can find all the lovely creations that are being made for the Paperie blog tour by clicking on the links below. Well the summer has passed by in a blur. Our family was away at the beach for most of it and the weather was fabulous for a change. We had lovely days out on the bay, swimming off boats and catching up with friends. It was blissful. There were some Townmouse items to be spotted on Adelaide to be sure. Above is one of my favourites: the Isabella top variation in a very pretty Liberty. But in my haste to escape to the beach, I forgot to share with you a very clever version of the Adelaide sundress made by Nicola before Christmas, showcased on her sewing blog CreatNic. Nicola also shared this fabulous dress on the Townmouse Patterns Facebook Group (have you joined?). If you have your own lovely creation made from Townmouse patterns we'd love to see it on the Facebook Group page. Also take a peek at Nicola's Isabella Flutter Sleeve Top on her gorgeous daughter too. Can you believe we are already in December? It's high time I mentioned there is a (not-so) new pattern in my Etsy store for the very popular Christmas Stocking. This stocking is the perfect size to hold a few treasures on Christmas morning. It has a hanging loop with button closure so you can loop it through a fireplace mantle bracket or door handle. The stocking is lined for extra strength. These were such popular items when I sold them as part of my range. I still have customers asking me about them as their family has grown and they need another stocking for another wee bub. There are so many ways you can personalise these. A linen version would be lovely with a cross stitched initial. Armed with some waste canvas and a few cross stitch motifs you could add snowflakes or other Christmassy details. You could use up your favourite fabric scraps and do a patchwork cuff instead of the pictured gingham. 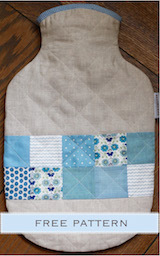 This would also be a fun project for children to practice their sewing skills on. I've grouped my patterns together in my Etsy store so you can save when you buy in multiples. There are pattern pairs at 10% off. And a trio of girl's patterns at 20% off. If you're sewing for boys, this pattern pair is the one for you. October went by in a blur of travel and general business. Will and I managed to head away on holiday to Morocco, which was divine. On the way home he had a couple of meetings in Copenhagen and Prague so we had two nights apiece in those cities. Copenhagen was my favourite and we can't wait to go back and explore more of Scandinavia. Now it seems like the end of the year is rapidly approaching. I snuck this pants pattern into my store a few weeks ago. It and the Adelaide sundress have been the most popular patterns according to my store stats. I love this pattern. Adelaide lived in these when she was a toddler. I found them indispensable and the perfect solution when she was crawling. They feature two back pocket options - a gathered pocket and a plainer pocket - so that when their bottoms are in the air as bubs scoot around on the floor there is a cute detail to see. These pants take no time to make, with no tricky closures. You don't even have to sew buttonholes, as the button closure on the cuff is faux. A denim pair with Liberty cuff and pocket would be rather fun to make. These baby cord ones were snuggly and warm for winter. A number of people have asked me about the little white top featured in the first and fourth photo. It's on the list of patterns to publish but won't be available until next year. The Matilda Gypsy Top starts in size 6 months and is a cute top to pair with the cuffed pants. I've paired them together in my store with 10% off when you buy the two together. When you sew the pants, please share your finished garments in the Townmouse Patterns Facebook Group. We'd love to see your work.